Cancer pagurus, commonly known as the edible crab or brown crab, is a species of crab found in the North Sea, North Atlantic Ocean and perhaps in the Mediterranean Sea. It is a robust crab of a reddish-brown colour, having an oval carapace with a characteristic "pie crust" edge and black tips to the claws. A mature adult may have a carapace width of up to 25 cm (10 in) and weigh up to 3 kg (6.6 lb). C. pagurus is a nocturnal predator, targeting a range of molluscs and crustaceans. It is the subject of the largest crab fishery inWestern Europe, centred on the coasts of the British Isles, with more than 60,000 tonnes caught annually. 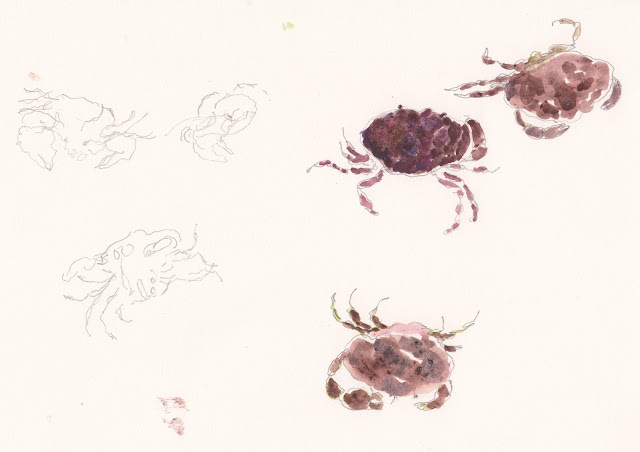 These studies of juvenile brown crabs were made on Gyllngvase beach, Falmouth on August 30th 2015. The spring tide following the supermoon allowed me to access usually unavailable rockpools. Due to working on location and drawing from live moving subjects I decided to make quick drawings concentrating on colour, form and texture.